Seer Stones (also known as Dragon's Eggs) are traditionally natural water or river-tumbled Quartz stones, which have had a face cut on one side to reveal the crystal's beautiful inner realms. They are an excellent ancient scrying tool, used for thousands of years by shamens, seers and wise ones. They are said to be able to assist in gaining insight to past, present and future situations, and are a super aid to any clairvoyant work. 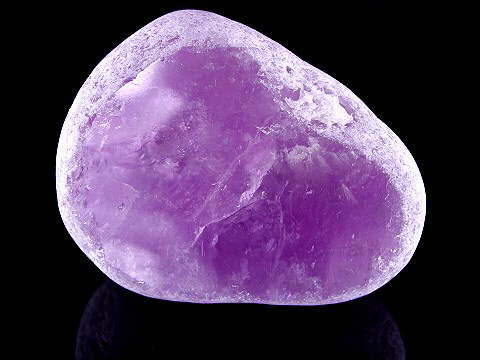 Each 'stone' bears the energies of the particular crystal it is made from - in this case it's Amethyst. Due to the individual nature of each crystal piece, they vary slightly from stone to stone and, therefore, may differ a little in appearence to the one shown in the photograph.